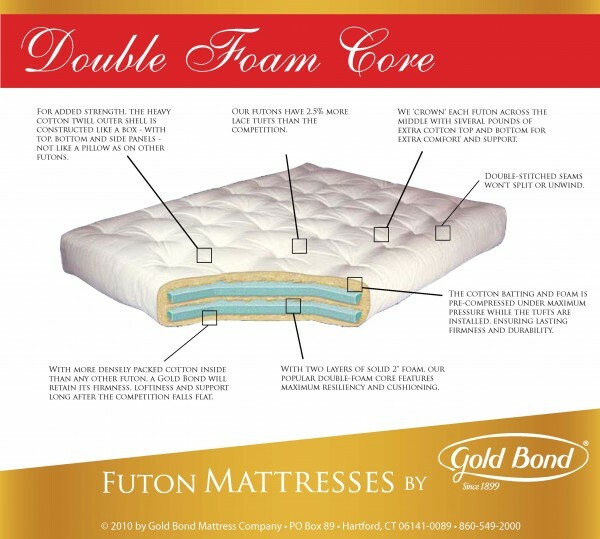 Gold Bond stands today as the world’s number one manufacturer of quality futon mattresses. Without question, Gold Bond stands today as the world’s number one manufacturer of quality futon mattresses, with distribution in 49 states and dozens of countries around the world. Why? Because no one can match our standards for quality materials, craftsmanship, durability and value. a Gold Bond is the ultimate choice in futons. This futon mattress features two 2" layer of 1.2 density foam and Joy® cotton batting. It provides greater plushness and softness than single foam core futons.